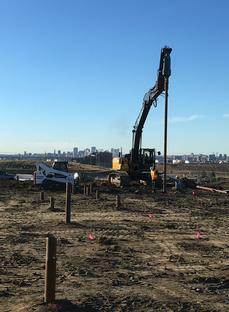 About Us - Alberta Screw Piles Ltd.
Alberta Screw Piles Ltd. is an innovative screw pile company that began manufacturing and installing screw piles for their own construction projects. 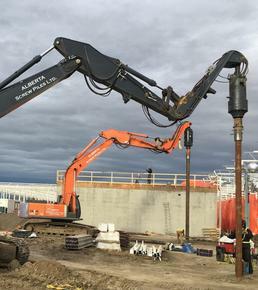 After years of completing a variety of projects from foundation to structure completion, Alberta Screw Piles Ltd grew valuable skills in project management, manufacturing, and a fleet of screw pile installation equipment. Throughout the years, this became the foundation of Alberta Screw Piles Ltd.
Our goal is to provide customers with the best foundation option for every site's specific application and requirement. We believe this is possible through getting to know our customers’ needs by studying the requirements conditions, designing & manufacturing a solution and then delivering & installing our engineered foundation onsite. Our team makes this possible with a strong drive to exceed the expectations of each job and with an attitude to learn & adapt throughout each project's challenges so we can better ourselves to be ready for the next challenge. We take pride in treating our customers with respect knowing their project is important. Whether it is a few piles or a few thousand piles, the need for a sufficient foundation within their timeline is imperative.